I remember I applied on the due date for submissions and was not sure if my topic would fit–I just submitted it anyway. I will announce my topic later. 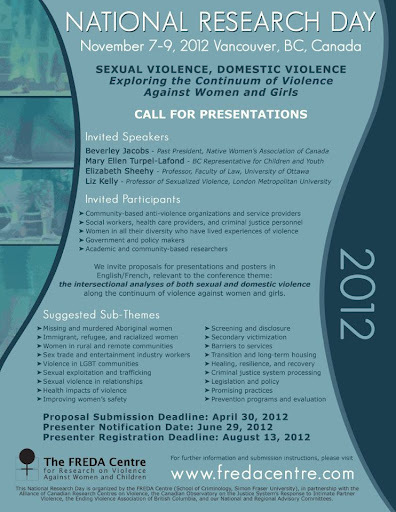 Just a little hint: the call for submissions asked for presenters to speak to the theme of intersectional analysis of both domestic and sexual violence along the continuum of violence for women and girls. There are many more sub-themes suggested. Check out the poster (below) for that list. Anyways, now I have a new project to be working on 🙂 I am definitely looking forward to this and definitely lots to be grateful for!